Many middle-aged parents are now buying more CDs than their teenage children, according to figures from the British Phonographic Industry (BPI). 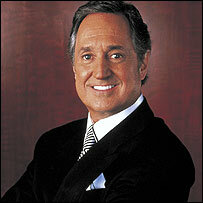 In 1963, Neil Sedaka was a teen pop sensation who thought his career was over. 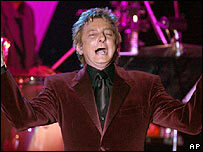 Forty-three years later, he's playing at the Royal Albert Hall and has just had another UK top 20 album. And he is not alone. Over the last few weeks, Andrea Bocelli, Russell Watson, Il Divo, The Carpenters, Barry Manilow, David Essex and Johnny Mathis have all had hit albums. The top 100 is strewn with records that can only be described as easy listening. And it is all a reflection of a significant change in the music industry - the power of "mum rock". Forty-somethings now buy more than twice as many pop CDs as teenagers and the gap is growing every year. Downloading is one factor explaining why teenagers are buying fewer CDs, especially when it comes to compilation albums. But there is another trend - older people are buying more music and going to more concerts. The average teenage record buyer now spends 25% less on CDs than they did five years ago, whereas the average 60-something CD purchaser is spending 30% more. For the last five years, sales to under-30s have been going down - from 43% to 34%. Older consumers (over 40s), especially women, have been increasing their share of the market - from 33.5% to 45%. And the biggest growth is among older women. Women over 50 now buy almost twice as many albums as teenage girls and the charts are now reflecting their tastes. So what accounts for the change? One reason is that today's 50- and 60-somethings have grown up with a culture of music buying. Buying records is often a habit that begins in youth and carries on through life. But there is also a big change in the way CDs are sold. Supermarkets now make up a large part of the retail market. Sales have gone from around 12 million in 2000 to around 40 million a year today. Prices have also fallen, making a CD an impulse purchase that can be popped in with the groceries rather than an expensive treat that could only be acquired by visiting often dark and noisy music stores. But on a more general point, it means the generation gap that used to be reflected by music is fast disappearing and it is the 40- and 50-somethings who are now pop's biggest fans.